EB had the opportunity to meet Everton (and arguably the World’s) best ever goalkeeper Neville Southall at the weekend. 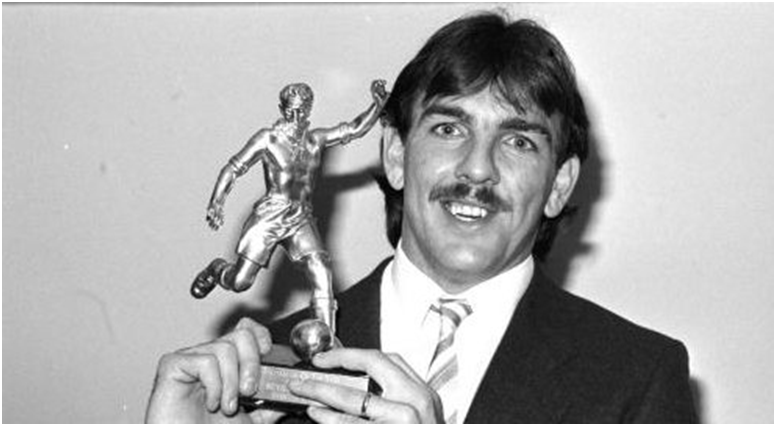 ‘Big Nev’ as he is known to the Goodison faithful, is Everton’s record appearance holder and the most decorated player in the club’s history. He also has an opinion or two on football…. so we asked him some tactics related questions…. Why do pundit’s say you should never get beaten on the near post? Surely getting beaten on the far post is just as bad? I’d look to trap people and get them do what I wanted them to do…. it’s mostly a mental thing. I’d stand on the near post which is basically saying to the striker to go and hit it far post so I was telling them where I wanted them to hit it. In one on ones you could pretend to go one way to make the striker go the other way… knowing what they were going to do you could prepare your body to move that way when the ball is struck. You played in Championship winning sides in the 80’s and had games when you were quite inactive due to the quality of talent in front of you at Everton. How did you maintain your concentration? I’d use a red / amber / green light system. When we had the ball in their final third it was green, I could relax. When it got to the half way line it went amber, and when they took it to the final third it was red. Look at Rob Green in the World Cup (vs USA)… he’s switched off and wasn’t ready for the shot. You can’t focus intensely for 90 mins…anyone who says so is lying…sometimes you can concentrate too much and your mind goes empty… but you need to get used to switching your brain up and down. What is the number one attribute which defines a great keeper as opposed to a good keeper? Decision making without question. If you haven’t got that right you haven’t got a chance of making it to the top. When to come for a cross, when to stay on your line etc. Look at Market Traders, they know when to buy and when not to sell. In the top flight every player is fit, the difference is in the decision making, same as it is anywhere on the pitch. Look at Beardsley when he played for us, threading through balls game after game…but no one was on his wave length to get on the end of them. Victor Valdez at Barcelona is often used as a sweeper. Do you see this as a growing trend for keepers? Keepers have been sweepers for years. It’s dependent on the defenders in front of you. If you’ve got 4 quick defenders you know you’re not going to have to do much. If you have slow players you’ll be doing plenty. Barthez at United had Rio Ferdinand and Laurent Blanc in front of him, one very slow, one lightening quick, and this often confused him and he’d get caught out. The tempo isn’t necessarily quicker these days, its just that teams all play deeper, counter attack football so with the break away it just seems quicker. In the modern games teams setup to counter attack, so deeper defensive lines, meaning you don’t get the through balls you used to get from the half way line years ago. Through balls now are closer to the goal and the mental knowledge to be able to read the game for a keeper is massive. Would you advocate studying opponent’s pre match or ‘in-game’ technology for preparing to face opponents in penalty shoot outs like Joe Hart at Euro 2012? No. You can’t look at it as one penalty in a shoot out, it’s over the 5. Buffon didn’t move unless he had to in that shoot out. Hart was wasting mental energy trying to put them off. He didn’t have the focus on what he was going to do. It’s all about emotion. If someone tells me Player X has hit his last 10 pens to the right but I fancy he’s going to the left it causes indecision in the keepers mind. The first penalty is vital, You need to go with instinct, I didn’t want people talking to me between penalties and if I needed to rely on an i-pad I’d be f*cked. What would you say are Tim Howard’s strengths and weaknesses as a keeper? His shot stopping and dealing with crosses is great. He also swears more than me which is fu*king great. If I was to be really picky I’d say he needs to look at his kicking. Sometimes if we’ve got little guys up front and you kick it long it’s going to come straight back at you. I’ve had plenty of coaches -Gordon Banks and Peter Bonetti for example – but Wilf McGuiness taught me everything I needed to know about goalkeeping. He’d say if a striker smashes you – Teddy Sheringham broke my ribs twice – you’ve got to get up and laugh at them. Jim Barron was probably my best coach; he got me the fittest I’ve ever been with his military sessions. 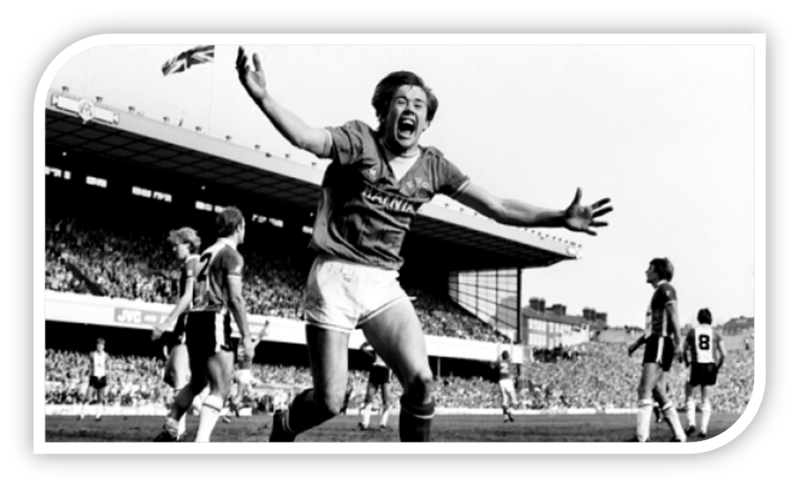 My idol was Pat Jenning’s who also played at Everton in the 80’s in the later days of his career. In terms of coaching, textbooks are well and good but individual plans are crucial. If you have one keeper whose 5ft and one who’s 6ft why teach them the same? One could be a coward whilst one will have plenty of bottle. I encourage younger kids to mix in with the older lads who have different qualities and so it’s not that much of a change when they move up the age groups. Coaching is about learning on the spot, you need to give kids info but cant overload if they don’t understand it. From 10 yrs you’ve got to ask them questions, find out what makes them tick. I don’t talk, talk, talk to them. What’s the point? I like to facilitate, let them discuss things. 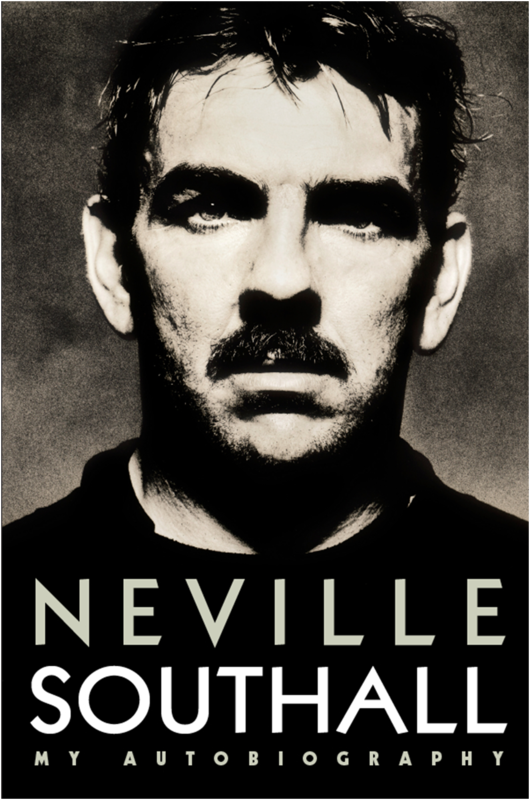 Neville Southall’s new book ‘The Bin Man Chronicles’ is available to buy at all Good Book Shops and online retailers. Many thanks to James Corbett and De Coubertin books for enabling the interview. There have been over 2.5 goals scored in 13 of Rayo Vallecano’s last 14 away games in La Liga. Back them away at Valladolid tonight. There have also been over 2.5 goals scored in 9 of Werder Bremen’s last 10 games in the Bundesliga. Also back Everton v Southampton, Barnsley v Ipswich and BristolCity v Leeds Utd for goals. 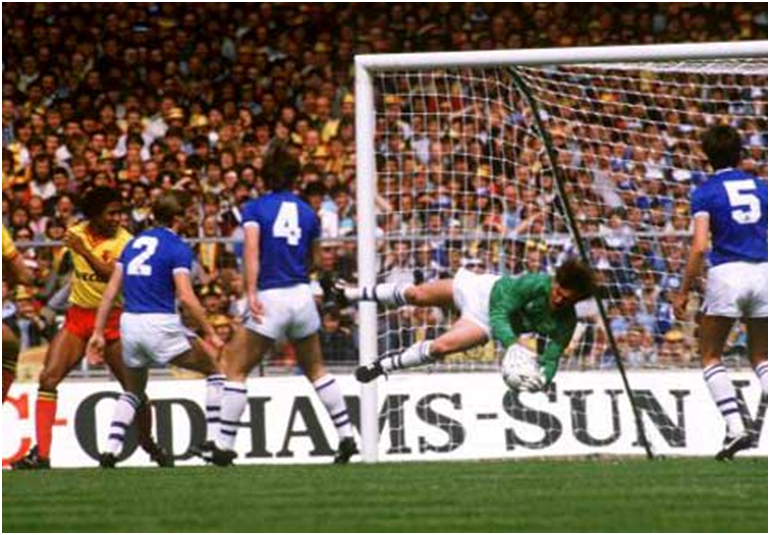 After the misery of Leeds on Tuesday we welcome Southampton – comfortably the most interesting to watch of the newly promoted sides – to Goodison in a fixture which has produced some high scoring and exciting games in years gone by. Defensively Saints will look to play a high line and condense the play further up field. They have made the fewest fouls in the top flight but have made the most interceptions with midfield workhorse Schneiderlin making the most in the top flight. In a contact sport where contact doesn’t seem to be allowed anymore, interceptions are the most effective, low risk method of regaining possession. It does perhaps hint that our visitors lack some bite although at the same time it reduces the amount of free kicks conceded which was a crucial error Swansea made against us last week.On the ball, they have played the fewest long balls per game and the most through balls, so they obviously like to play a short passing game and look for incisive balls in the final third. They are very positive too as was shown by the fact they led against both the Manchester clubs going into the final stages of the games. The United match in particular demonstrated this positivity in possession, with 33% of their passes being played forward compared to United’s 27%. This approach should be applauded given the predominance of percentage football evil cabal bores such as O’Neill and fattie Allardyce. Averaging 3 goals conceded per game is quite a damning statistic. Already goalkeepers and centre backs have been shuffled in and out which doesn’t provide cohesion. Man United got 3 goals from crosses whilst Gibbs – very much a poor man’s Leighton Baines – had a field day in the Gunner’s 6-1 slaying a few weeks ago against Clyne at right back who was afforded little protection from Puncheon on the right side of midfield. The above shows an example of Arsenal overloading down the left 3 v 1 on Clyne for the first of Gibbs two assists. The below visual is from our last home game against Newcastle and shows how Fellaini (blue) similarly likes to drop into this zone to assist Baines/Pienaar (yellow) overload the opposition down the left. It’s likely this is going to be an area we can get plenty of joy. Jonny Heitinga was preferred to Distin at the heart of defence, perhaps due to the fact Swansea don’t have a quick central striker or have a significant aerial threat as a team. More surprising was Seamus Coleman’s selection at right back. Although this is his ‘natural’ position, it was the first time Moyes has selected him from the start in a premier league game. Up front the much maligned but currently superbVictor Anichebe played through the middle with Fellaini again playing as the second striker. Swansea setup in a 4-2-3-1 but had big problems selection wise, leading to in experienced players being brought in and crucially without defence-midfield link man Leon Britton who was only fit enough to start from the bench. Much is made of Swansea’s passing game but it was ourselves who bossed things on the ball. After a solid start we had 72% of the ball in the first 15 minutes with 42% of the game being played in Swansea’s defensive third, compared to 7% in our defensive zone. Our hosts passing tempo in comparison was unusually slow. Very few teams have been able to dominate the ball against Swansea, and only on one other occasion since they came up to the top flight have a side had a higher possession total than we did yesterday (52%) against them. The risk of playing two big physical players like Anichebe and Fellaini in the forward positions is that you will go direct but we played everything on the floor with our passing accuracy (85%) also better than the Swans. Crucially, we made 135 successful final third passes to Swansea’s 44 which led to 64 touches in the Swansea 18 yard box compared to our host’s 24. The power of the left side is helped substantially by one of the forwards – usually Fellaini – drifting across to the left side to help Baines / Pienaar outnumber opponents (check out Baines goal vs Newcastle as an example) but with Anichebe being more of a left sided player the Nigerain did this job with Fellaini playing more centrally as Jelavic would. Our approach off the ball was to close down forward passing angles from Swansea, playing aggressively high up the pitch and generally stopping them playing through us, as shown in the below visual. As an example, Vorm is noted for being one of, if not the best, distributor of any keeper in the top flight and being the starting point of Swansea attacks with an average pass completion this season of 79%. Against us it was down to 58%. Our hosts play very narrow – even their wide forwards are quite insular – and the ball was regularly played into the middle of the park where we pressed and their attacking moves were invariably quashed. Swansea couldn’t handle our quick passing tempo which led to constant fouling and subsequent free kicks with a foul committed by the home side every 4 minutes. The significant physical advantage we had over our hosts was huge, demonstrated by the fact we also won 60% of the aerial duels. Pienaar in particular was buying fouls for fun and was brought down a massive 7 times, mostly from Angel Rangel who had a shocker although in fairness he was afforded no protection by Hernandez who was hauled off at half time. Only Gutierrez and Hazard have won more fouls in the top flight than the South African this season. Swansea’s foul play had a direct correlation with our goals output. The first goal came from a foul down the left side. 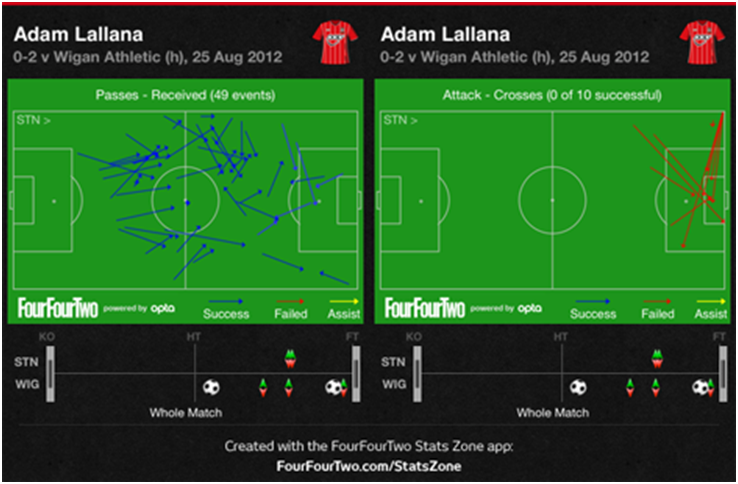 Fellaini had a hand in all three goals and his aerial threat is colossal. As the ball is whipped in by Baines 2 defenders are sucked in to occupy him – including Anichebe’s marker – enabling the Nigerian the space to slot goal 1. Anichebe’s goal was his second consecutive scoring game in the league– something he has never done before – and the signs are good that his consistency is on the up as is his mental ability to dominate inferior opponents as he did with the hapless Alan Tate, who was put of his misery by Laudrup shortly after the interval. The second goal owed much to some great cover play by Phil Neville who assisted Coleman a lot from centre mid. His defensive awareness snuffed out a Swansea break and played the ball to Fellaini who showed the importance of his versatility by dropping deep to assist the back four and then playing a delicious through ball which dissected a very flat looking Swansea defensive line. 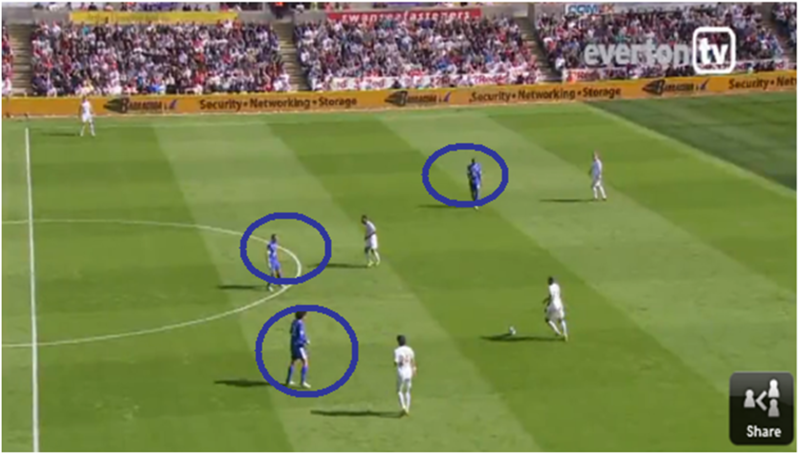 Pienaar then played an ace ball into the middle which Mirallas buried. Goal 3 was again a result of a free kick, this time when Michu clumsily hacked down Baines who then produced another superb centre which was dispatched by the curly haired menace. Even without the fouls, we created enough chances to win 3 games. 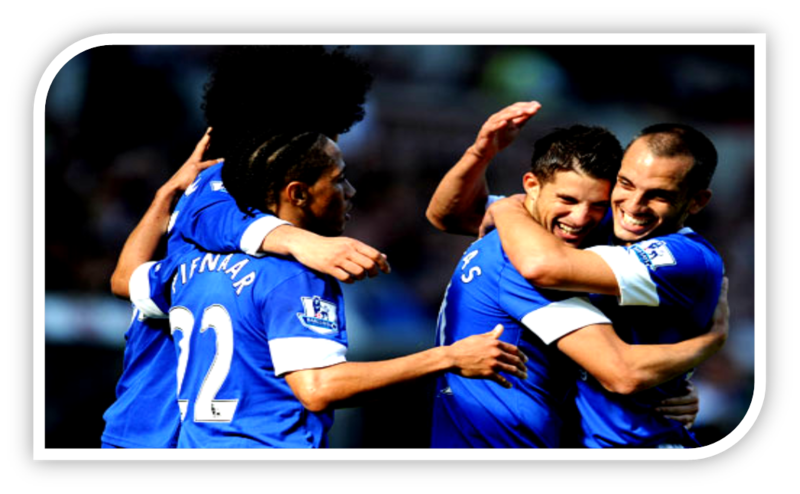 We all know the brilliance of the left side but now with Mirallas on the right we are less one dimensional. In total we had 31 shots and our average shots per game this season (20.4) is the best in the division.